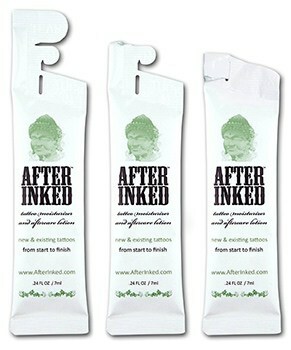 After Inked 7ml re-closable pillow pack sachets are specifically designed for sale in tattoo studios. We can also provide posters to help educate customers about tattoo aftercare. Apply After Inked™ to clean hands and massage over entire tattoo until lotion is no longer visible. Repeat 2 to 3 times a day or as needed. 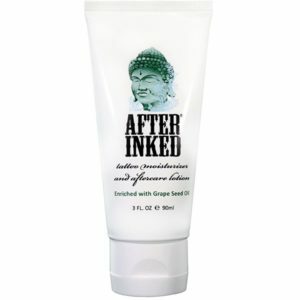 Continue using After Inked™ every day to keep your tattoo vibrant and moisturised! Vitis Vinifera (Grape) Seed Oil: Provides vitamins E, C & Beta Carotene. It’s anti-inflammatory and a potent antioxidant & anticarcinogen. 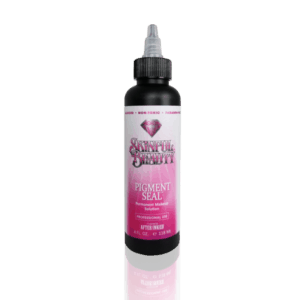 Aids wound healing by regenerating damaged blood vessels and strengthening skin tissue. Grape Seed Oil preserves natural skin moisture and helps wounds heal faster. Glycerin (veg): Conditions & moisturizes the skin. Butyrospermum Parkii (Shea Butter): Helps cell regeneration and it’s anti-inflammatory. Simmondsia Chinensis (Jojoba) Seed Oil: Aids in the healing process and improves the skin elasticity & suppleness. Synthetic Beeswax: Emulsifier & nourishing to skin. Alternative to animal-derived beeswax obtained from the honeycomb of virgin bees; minimizes allergic reactions and respects lifestyle choices (Vegan). Cetyl Alcohol (veg): Emulsifier & skin softener. Benzyl Alcohol & Dehydroacetic Acid: Protects from bacteria & fungi. Natural alternative to parabens. 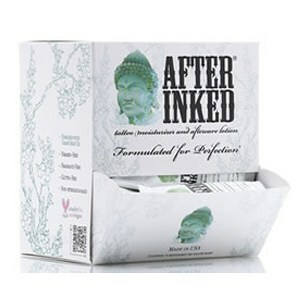 After Inked™ is 98% Natural and most important, After Inked™ is safe, patented and it works. Why isn’t it 100% natural? To qualify as a vegan product no animal ingredients could be added so synthetic bees wax was used instead of the natural alternative. Your skin is your largest organ, and what you put on it gets absorbed into your body! Knowing what’s really in the products you use makes a difference. Just as you read food labels, you should read personal care labels and ingredient statements.